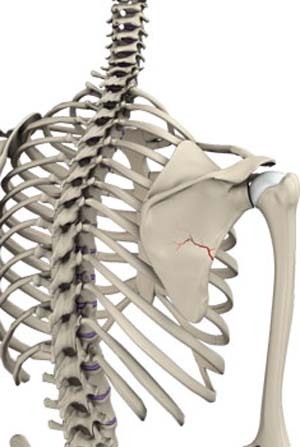 Scapular fractures are uncommon but do occur and require a large amount of force to fracture. They are usually the result of intense trauma, such as a high-speed motor vehicle accident or a fall from height onto one's back. They can also occur from a fall on an outstretched arm if the humeral head impacts on the glenoid cavity.